“We picked up the first destroyer two hundred miles out of San Francisco, right ahead, and that was a great relief to me. It certainly gave me the assurance that my compass and methods were all right. “Soon after we passed the first—about an hour, I think, after we passed the first ship—the other plane, the PN-9 No. 3 was forced down, and a successful landing was made, although of course that plane was still very fully loaded with gasoline, and that full load was—gross load—was 20,000 pounds, ten tons. “That plane made a successful landing at night on a rough sea; and I think it is one of the greatest pieces of seagoing airmanship that has ever been accomplished. The hull stood up very well under the strain, but the flow was so great that the gasoline tanks, which originally were square, were bulged out so they were perfectly cylindrical. “We continued the flight and picked up all the station ships without any trouble during the night. In the morning, the clouds cleared up; the sun came out fine and bright; everything was fine. But there wasn’t any of that wind that we needed to push us along. “Well, we passed the eighth station ship, the 1,600 mile mark, and decided to land at the 1,800 mile mark. It never occurred to me, that having picked up all these other ships without any difficulty, we would have any difficulty in picking up the one that we really wanted to pick up. It really didn’t make much difference whether we picked up the others or not. “Something happened to the navigator or something; I don’t know what it was; but anyway when we got to the place where I thought we ought to see this ship, we didn’t see her. We flew down a radio bearing, and chased around for about an hour, following different radio bearings, and finally the gasoline gave out, and so naturally the engine wouldn’t run any more and we came down. “The landing was made under very difficult circumstances, since there was no power. That means that we only had one chance. 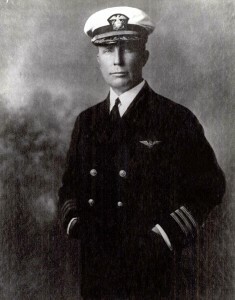 The pilot, Lieutenant Connell, was at the wheel, and he did it perfectly, although he had been sitting in the pilot’s seat all during the flight. “Well, I kept a record of our courses and I plotted them up, and I found we were about 50 miles north of the Aroostock’s position, and a little later I got some sights, and I found it was right. And then we rigged an antenna, so we could hear messages all right, but we couldn’t send because we required the engines to drive the generator, which made the juice, to do the sending; and we didn’t have any gas to make the engines go; so we didn’t have any juice to send. Well, we didn’t worry very much about that. We thought some fellow would come and pick us up pretty soon, and give us a little gas, and we would get off, and go merrily on our way. So we held everything together then; we could see what was going on; we could see when the ships came near, and when they went back and it did not take us long to find out that we were not probably going to get picked up at all. “So along about the second day, we stripped the fabric off the lower wing, and rigged them up for sails between the wings, and we started the sails for Nawiliwili, Hawaii. That was the last stopping place in the Hawaiian Islands; and we had to pick that out, because the wind blew in that direction. “We would have had a very pleasant trip of it, but we didn’t have any water, or not much water. We had two quarts a piece when we started. It wasn’t until the eighth day that a rainstorm came right over us. Then we got quite a lot of water, a couple of gallons. “We were fixed up fine, although the fabric we caught it in had been painted with aluminum paint, and that chipped off and mixed with the water, and it didn’t taste very good. But still it didn’t prevent us from drinking it. “On the seventh night we were about 40 miles north of the island of Oahu. That’s where all the Army is in the City of Honolulu, and that night we saw the Army searchlights at Brill, reflected on the prow. So that refreshed everybody, and checked up my navigation all right, which was more of a relief to me than it was to anybody else I think. “And then in the morning, we could see through the haze or rain—we could see part of the Island of Oahu; but it did not seem possible that we could make it, although by that time Connell had invented leadboards. “He had dug up some metal floor boards and hung them over the sides, so that instead of going just before the wind, we could make 15 degrees on either side of it. And if he had only been smart enough to think of that about four or five days before, we might have gotten into Honolulu, and gone ashore, and telegraphed to the commandant that we were there. That night—that was the last night; it was a rather hard night for me, because I had made the decision to go on, and the responsibility was mine for getting over to the Island of Kauai. And sure enough, in the morning, we picked up this Island of Kauai, just where we thought we were going to get it, and we headed down for the harbor of Nawiliwili under full sail. Additional Links Links to information about John Rodgers on other web sites. John Rodgers Field The Territory of Hawaii dedicated its first airport on March 21, 1927, naming it after Navy Commander John Rodgers who made the first trans-Pacific flight in 1925. Life of John Rodgers 1927 Honolulu Star Bulletin article about John Rodgers. First Attempt to Fly to Hawaii An excerpt from the book Above the Pacific by Lieutenant Colonel William Joseph Horvat, 1966. Rodgers Rescued Bulletins from 9-10-1925, announcing the rescue. 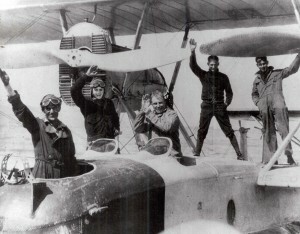 Before the Flight – Articles Articles and images relating to preparations for the flight by John Rodgers, circa 1925, are scanned from various sources. Missing at Sea – Articles Articles about the missing plane and the search for John Rodgers and his crew, circa 1925, are scanned from various sources. Rescue at Sea – Articles Articles about finding John Rodgers and his crew, circa 1925, are scanned from various sources. Back on Land – Articles Articles about the plane and the crew arriving on Kauai, circa 1925, are scanned from various sources. Air Heroes – Articles Articles about the fanfare greeting John Rodgers and his crew, circa 1925, are scanned from various sources.